Definition and Summary: Nat Turner's Rebellion, also referred to as the Southampton Insurrection, was a slave revolt led by their religious leader, Nat Turner, that started on August 21, 1831 and was quashed within 48 hours. Nat Turner had been joined by about 60 slaves who killed up to 65 white people. The state executed 55 slaves, including Nat Turner who was captured on October 30, 1831. At least a further 200 slaves were murdered by white mobs fuelled by the hysterical climate that followed the revolt. Nat Turner's rebellion raised southern fears of a general slave uprising and had a profound effect on the attitude of Southerners towards slavery. 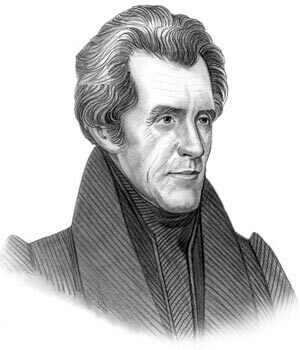 Andrew Jackson was the 7th American President who served in office from March 4, 1829 to March 4, 1837. One of the important events during his presidency was Nat Turner's Rebellion in 1831. Nat Turner's Rebellion was a direct result of the growth of slavery in the South. The invention of the Eli Whitney Cotton Gin had made slave labor vastly more profitable as cotton became a highly profitable cash crop that used the slave plantation system of farming. The rise of 'King Cotton' ended all hopes of peaceful emancipation in the South. About a year before Nat Turner's Rebellion a new movement in favor of the negroes began in the North. A preacher called William Ellery Channing (1780 – 1842), proposed that slaves should be set free, and their owners paid for their loss from the sale of government owned lands. A Boston journalist called William Lloyd Garrison (1805 – 1879) began the publication of a paper called the Liberator and went one step further. He proposed for complete abolition of slavery without payment to slave owners. Abolitionism was based in the North, and white Southerners alleged it fostered slave rebellion. The religious revival movement, referred to as the Second Great Awakening, also inspired slaves to demand freedom. Nat Turner, unlike most slaves, had learnt how to read. He was deeply religious man, he experienced a series of 'visions' and no doubt influenced by the Second Great Awakening and probably the literature of the Abolitionists. The Abolitionist Movement was established in 1830. Also refer to the Fugitive Slave Act. All of the above factors were relevant to the insurrection and the subsequent events surrounding Nat Turner's rebellion. When did Nat Turner's Rebellion take place? Nat Turner's Rebellion began on August 21, 1831 and ended when he was captured on October 30, 1831. Where did Nat Turner's Rebellion take place? Nat Turner's Rebellion took place in Southampton County, Virginia. The small group of conspirators met at a place called Cabin Pond with the immediate goal of getting to Jerusalem (now renamed Courtland) The town of Jerusalem was a small hamlet with less than 200 people. What was the effect and impact of Nat Turner's Rebellion? What was the Significance of Nat Turner's Rebellion? Interesting Nat Turner Rebellion Facts, Timeline and Biography for kids are detailed below. The history of Nat Turner's Rebellion is told in a biographical timeline sequence consisting of a series of short facts providing a simple method of relating the life of the slave, his owners, a history of the revolt with timeline dates, his capture, the imprisonment and the death of Nat Turner. The revolt was well documented in the newspapers of the era and on December 1831 "The Confessions of Nat Turner" were published in Baltimore, Maryland by a lawyer called Thomas Ruffin Gray. The "Confessions" of Nat Turner were dictated to Thomas R. Gray whilst he was imprisoned in the Southampton County Jail. The Nat Turner Rebellion Facts, Timeline and Biography are taken from a number of these sources. Nat Turner Rebellion Fact 10: 1823: Samuel Turner dies and Nathaniel and Cherry are put on the auction block and sold to different owners. Nat Turner Rebellion Fact 12: 1825: Nathaniel experiences spiritual visions and slaves believe he has divine powers. Nat Turner Rebellion Fact 17: August 21, 1831: A solar eclipse was seen as a sign to stage an insurrection. Nat Turner Rebellion Fact 18: August 21, 1831: Seven men (Nelson Williams, Sam Francis, Jack Reese, Will Francis, Henry Porter and Hark Travis) dine with Nathaniel at Cabin Pond. The revolt begins that night. Nat Turner Rebellion Fact 19: August 21, 1831: The Travis household was their first target - the entire family is killed. Nat Turner Rebellion Fact 20: August 21, 1831: Other slaves join the revolt and the killing continued through the night until the next day. Nat Turner Rebellion Fact 23: August 22, 1831: The slaves fought state and federal troops. Some were captured, others including Nathaniel escaped. The slave army dispersed. Nat Turner Rebellion Fact 28: November 5, 1831: The trial at the Southampton County Court. Nathaniel is found guilty as an insurgent (rebel) and is sentenced to be hanged. Nat Turner Rebellion Fact 29: November 11, 1831: Nathaniel is hung at noon. Nat Turner Rebellion Fact 31: December 1831: "The Confessions of Nat Turner" were published in Baltimore, Maryland by Thomas R. Gray. For visitors interested in African American History refer to Black History - People and Events. A useful resource for teachers, kids, schools and colleges undertaking projects for the Black History Month. The article on the Nat Turner's Rebellion provides an overview of one of the Important issues of his presidential term in office. The following Andrew Jackson video will give you additional important facts and dates about the political events experienced by the 7th American President whose presidency spanned from March 4, 1829 to March 4, 1837.